You've found the “U.S. 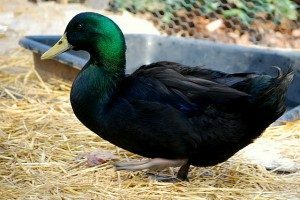 Cayuga Duck Breeders” page here at Hobby Farm Wisdom! If this is the first time you have visited our site: Welcome! The Cayuga Duck is a domestic duck that is used for egg and meat production and they are also good pets. The males weigh about 8 pounds and the females 7 pounds. It has an iridescent black plumage which looks green depending on the lighting, it also has a black bill, shanks and toes, the eyes are brown. The Cayuga ducks have a docile temperament, their quacks are not loud and the males are often quiet, which makes them good pets. They one of the hardiest domestic ducks, able to tolerate the harsh winters of the northeast and are still produce large broods of ducklings. The name Cayuga comes from Cayuga Lake, a lake in the Finger Lakes region of New York State, where the breed was popularized.